Given the recent instances of credit defaults in debt funds, we have been receiving queries from investors as to whether Quantum Liquid Fund also has exposure to such entities which have seen erosion in market value or which have defaulted. Over the last few months, we have been communicating about the investment philosophy of Quantum Liquid Fund. This article is a continuation of our investor education efforts on the positioning of Quantum Liquid Fund and making investors aware of investing in debt funds in general. Right from its inception, Quantum Liquid Fund (QLF) had an offer document driven mandate of investing 80% of its assets in the highest quality instruments. Over time, as we learnt from various liquidity and macro-economic shocks, especially of 2007-08 and 2012-2013, we have tightened our investment mandate. We follow the SLR investment philosophy (Safety, Liquidity and Returns) for managing the fixed income funds at Quantum. We realized that achieving all three - high safety, high liquidity and high returns is not easy. The investment objective of a liquid fund is to keep your investment safe and liquid and try and achieve slightly higher returns than bank savings deposits. Thus, liquid funds' portfolios should have very high liquidity, minimum volatility and near zero chances of capital loss (credit risk - risk of default of interest and principal). 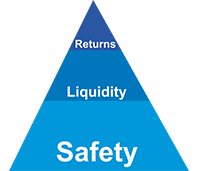 Quantum Liquid Fund prioritizes Safety and Liquidity over Returns. Although Quantum Liquid Fund is allowed to invest in corporate debt as per the offer document but as per the current internal investment policy, it has not invested in any Private Corporate Debt. Thus debt instruments of companies mentioned in recent media articles which have defaulted or are reportedly under stress may not make it to the portfolios of Quantum Liquid Fund or Quantum Dynamic Bond Fund. QLF has no investments in any instruments issued by Private Corporate Sector entities. The Quantum Liquid Fund now has investments only in Government Securities, Treasury Bills and Commercial Paper/ Certificate of Deposits issued by AAA rated PSU entities (Public Sector Undertakings). The fund thus hopes to mitigate the issue of credit risks (risk of default) and liquidity risks (unable to liquidate/sell the assets to meet redemptions) by investing in safer and more liquid instruments. Therefore while the returns that the Quantum Liquid Fund generates may be lower than its peers, the risk that the Fund takes is also lesser. Quantum Liquid Fund also follows an industry leading practice of completely marking to market (MTM) its entire liquid fund portfolio in keeping with SEBI's mandate of fair valuation of securities. This ensures that the NAV of the fund is more closely linked to the actual realizable market value of the assets. We disclose our portfolios of Quantum Liquid Fund on a weekly basis enhancing transparency, click here to peruse the portfolios and know more about the fund. To invest in the Quantum Liquid Fund click the button below!